I once had an otherwise healthy looking tree fall down on a nice, calm summer day. Once it was on the ground, however, we could see that the center of the trunk was totally rotted. The canopy of foliage had appeared to be dark green and the leaves looked great. What happened? It was the result of an invasion by a very common fungus that causes rot in the heart wood of trees. Remember that the true "living" tissue on a tree trunk occurs at that thin layer called the cambium just beneath the bark. Tissue in the cambium is able to produce new cells (xylem and phloem) but the cells toward the inside of the tree no longer have that ability. So, unlike we animals, part of a tree, the "dead" wood on the inside can rot away and not really impact the tree as long as the cambium layer is not involved. How does this work? Rot is nature's way of breaking down complex organic tissue into its component parts. The key organism that does this rotting are fungi. They "eat" the organic matter and turn into what looks like fine textured sawdust. To do this effectively, the fungi needs a good supply of moisture so, the rot may be encouraged by the presence of some type of damage which allows moisture to enter through the bark. It would seem logical that, once rot gets started, the whole tree would rot away. However, this does not happen because another characteristic of trees is that they have the ability to set up barriers and "compartmentalize" problems that occur in a branch or in the trunk to protect the rest of the organism. The rot will progress to a certain point but the tree will eventually set up a chemical barrier that will put a stop to it. Unfortunately, this only leaves a hollow, weakened place in the trunk which makes it more liable to break off. 1. Carpenter Ants - One thing to remember about these insects is that they do NOT EAT WOOD!. Rather, carpenter ants burrow into generally rotting wood to make their tunnel-like nests. That is why you will find fine-textured sawdust at the base of a tree infested by carpenter ants. Since they are almost always found in rotting wood, their presence is a sign of rot in the tree. More on carpenter ants. 2. Shelf Fungi - Since most of the rots are caused by fungus, they produce mushrooms. In tree rots, they result in shelf-like fungi that are often quite colorful and almost decorative. Unfortunately, they are a sign of serious trouble especially if they are located down near the soil line. More on shelf fungi. 3. Shade Tree Decline - Although a tree may be declining into poor vigor for many reasons, one of them could be a rot inside the trunk or major limb. More on shade tree decline. 4. Tree Falls Down - Of course, the ultimate symptom of rot will occur when the tree or a major limb falls down to the ground. Generally, this will expose the rot inside. Of course, anything you can do to keep the tree in general good health will aid in preventing internal rots. 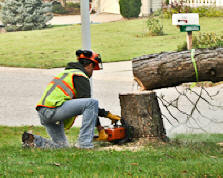 Perhaps the key is the prevention of physical damage such as banging into the trees with mowers or equipment and using proper pruning techniques. Remember that fungi need moisture to thrive so any opening in the bark of the tree, especially in the crotches, can lead to rot over time. Prevention is the key to control. The only "treatment" would be to remove rotted parts of the tree if you can. If the tree is infected with a major amount of rot, you need to evaluate it to determine if it needs to be cut down. Trees that are near buildings, houses, garages or places where people might be involved if they fall down, are of special interest. If you have concerns, there are people called Consulting Foresters who are often trained in evaluating the sturdiness of trees for a fee. Do a web search or check with your local Extension Service office for a list of qualified people in your area.